Kiefer Sutherland is back as Jack Bauer in the long-awaited, heavily-hyped 24: Live Another Day. While the two-hour premiere didn’t offer anything new to the series’ previously-established style and format, it was a satisfying kick off. Don’t call it season nine, as this 12-episode run is officially a “limited event television series.” Considering that four years have passed since the season eight finale, Fox apparently hedged its bets by cutting the normal run in half. Ratings for the premiere were solid enough to indicate continued interest in the show. Aside from a few visibly older returning cast members, you’d never know so much time has passed. The familiar digital clock countdown still takes us in and out of commercial breaks. Though obviously there will be jumps forward in time as the series progresses, events happen in real time as they always have. Jack has been lying low since his revenge-fueled rampage of season eight. He’s discovered in London, apprehended by the CIA, and questioned by a seemingly barely-competent operations director, Steve Navarro (Benjamin Bratt). The reason Steve seems so clueless is that, despite his feel-strong façade, his field op Kate Morgan (Yvonne Strahovski) is always a step or two ahead of him. Kate figures out very quickly that Jack was a little too easy to catch. Bear in mind we can’t avoid spoiler territory at this point, so if you haven’t yet seen the episodes, better turn away. It turns out Jack, who doesn’t even speak a line of dialogue until nearly two-thirds into the episode, is in town due to a planned attempt on the life of President Heller (William Devane). Yes, former Secretary of Defense Heller has received quite a promotion since the last time we saw him. He’s also suffering from dementia, advancing at an alarming rate (especially for a Commander in Chief). His daughter, and Jack’s former flame, Audrey (Kim Raver) has recovered from the debilitating PTSD she experienced at the end of season six. Now married to Heller’s Chief of Staff Mark Boudreau (Tate Donovan), everyone around Audrey carefully tiptoes around the whole Jack issue. In order to try and uncover the details surrounding the planned assassination, Jack needs to reunite with Chloe O’Brian (Mary Lynn Rajskub). Chloe has gone underground following a prison sentence she received for her assistance in Jack’s escape at the end of the previous season. 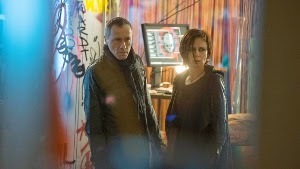 Having taken up with a Julian Assange-type hacker and information disseminator, Adrian Cross (Michael Wincott), she’s lived a bit of an anarchist lifestyle. Her emo-makeover is a bit silly looking, but if you’ve seen all the advance promos you’re probably (hopefully) already accustomed to it. Luckily the irreplaceable Rajskub is in good form, letting us know that deep down Chloe might not have changed as much as her current look and lifestyle suggest. And so we’re off and running, with the major players established. Some of the early critics’ reaction has carried a “been there, done that” attitude. While it’s clear that the producers had no intention of re-inventing or re-branding the show, I’d say that everything is looking good so far. 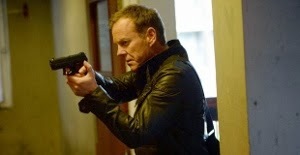 The action was as tightly-paced as we’ve come to expect from 24 and the plot took flight quickly. Sometimes with past seasons it took a few weeks for things to really ignite (season seven, while one of the best overall, seemed to have trouble initially finding its legs). Given the four-year gap, it would’ve been fairly understandable if things hadn’t taken off with a bang, but that’s not the case. Relevant topical issues are solidly, if not subtly, interwoven into Live Another Day. Controversial military drones are front and center when the U.S. military literally loses control over one in Afghanistan, helping to throw a wrench in the works between Heller and the British prime minister’s relations (British soldiers perished in the rogue attack). And of course there’s the WikiLeaks-esque aspect, something that Jack doesn’t exactly approve of (and he lets Chloe know, quite forcefully). While a few twists and character motivations are telegraphed perhaps a bit too obviously, there’s no reason to assume anyone knows exactly where 24: Live Another Day is heading. I’m definitely looking forward to finding out.